Not exactly a heavy-duty machine and easy to operate, the Lawn-Boy 17734 gas-powered lawn mower is built for intuitive convenience. Well engineered and reliable, its electric-start engine starts with the simple turn of a key. 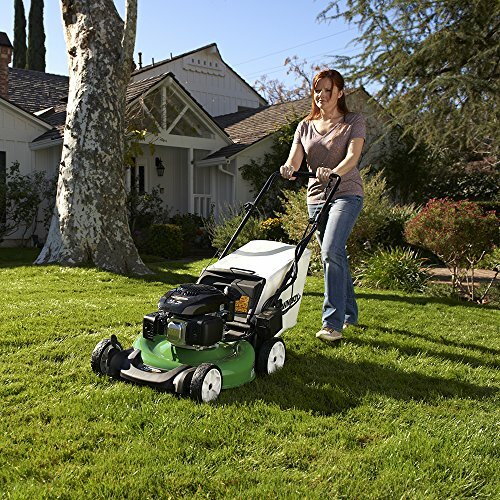 Once you get going, there’s not much hard work involved since the mower has rear-wheel drive self-propulsion and exceptional traction under any mowing conditions. 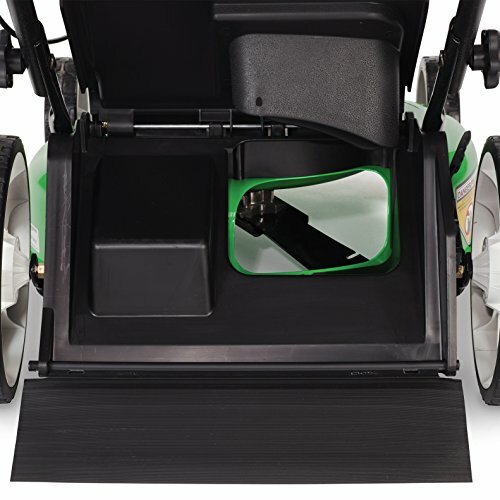 The durable 21-inch deck has a Tri-Cutting system that provides an awesome cut, and you have the 3-in-1 mowing options of mulching, bagging, or side discharge. Lawn-Boy backs up its products with a 3-year Tru-Start Commitment and a 2-Year No Worry warranty, which I’m impressed with. The mower is guaranteed to start on one or two pulls for three years or gets fixed for free. The mower’s Kohler XTX engine is a commercial-grade juggernaut that is durable, reliable, and smartly designed with the operator in mind. 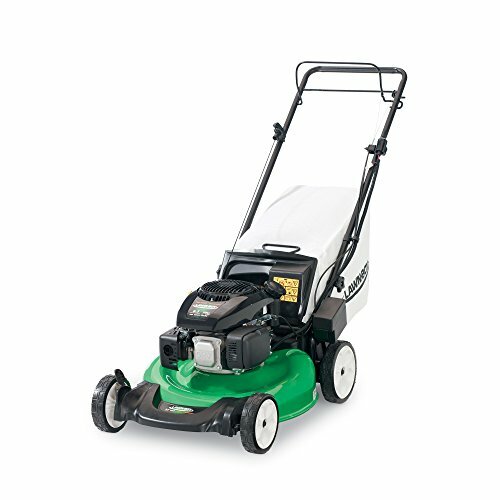 Built to last and generally low maintenance, the engine is on the quieter side for a gas-powered mower and moves the blades at a powerful and efficient rate for a clean, even cut. One of the best features of this mower is its easy-starting capability. 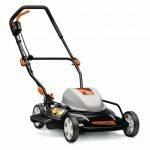 It’s designed to be user-friendly, but be warned that you may not want to use the mower on damp grass because things may get clumpy under the deck, or the engine could even die. But under regular conditions it does a solid job. I’ve used mowers with better maneuverability, which is perhaps due to the short length from the handle to the front wheels. The position of the bag, if you choose to bag clippings, is not ideal (see below) and may shoot clippings straight upward. Emptying the bag is not a picnic either, as clippings are almost guaranteed to get all over your hands. Watch out if you’re sensitive to allergies. 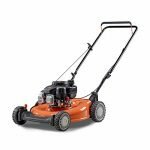 This mower was designed with ease-of-use in mind, which is evident by its easy electric starting and the two-point height-of-cut adjustment, which allows for adjusting the deck height two wheels at a time, speeding along that adjustment that may need to be made from time to time. 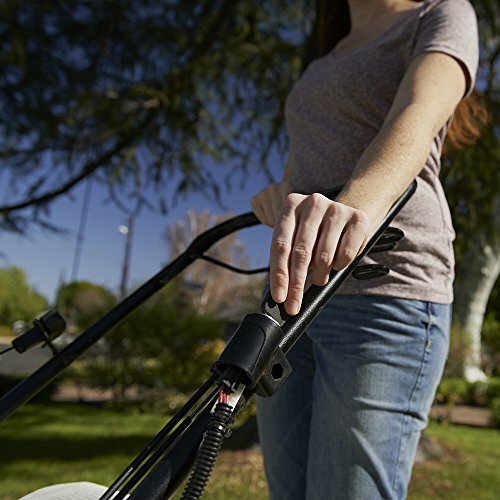 Note that the height adjuster may slip out of place from time to time, so keep an eye on it so that the blades don’t inadvertently shave your grass. That aside, this is a highly accessible mower from the old to the young. It’s easy to start, easy to assemble, self-propelled, and has an adjustable handle for all operator sizes. 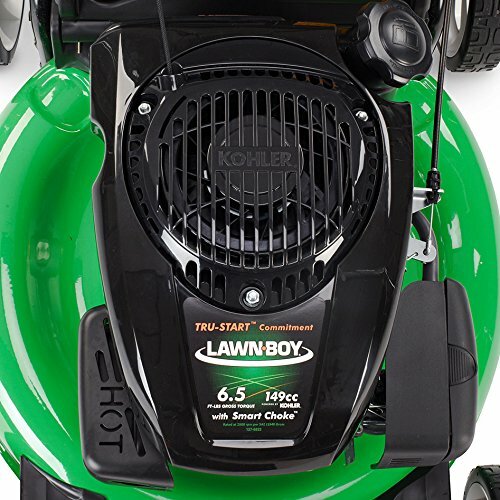 Many will love this mower because it doesn’t require oil changes. If you’ve got slopes are hills, the mower’s rear-wheel drive and great traction should make this terrain easy to conquer. One notable design flaw is that the battery for the electric-start option is located on the left side of the handle. Can you guess what may happen at that location? Yes, it can easily get knocked off if you’re not careful. Also regarding the handle area, the self-propulsion on this mower works great, perhaps even too great The machine will really fly if you pull the bar all the way down, so ease it down gently until you get used to the variable speed option. 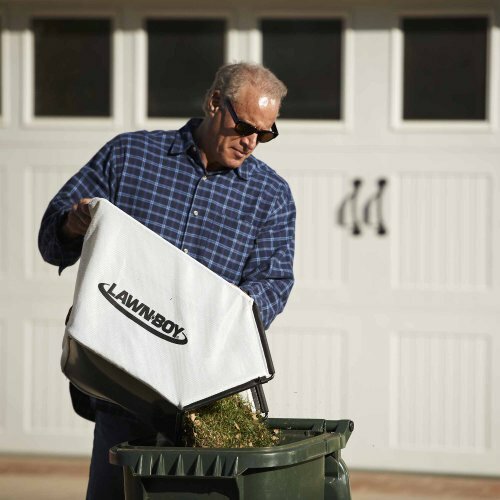 Choose from the 3-in-1 options of bagging, mulching, or side discharge with the L-B17734. Mulching is an especially wise choice, given the capability of the 21-inch steel, deep-dome deck that offers a superior cut. If you look at the blades, you’ll see they have a special design with small holes in the back of the jagged edges, thus decreasing clumping. The large capacity of the bag collector means that, ideally, you won’t have to stop all that often to empty clippings. Depending on conditions, though, that may not always be the case. 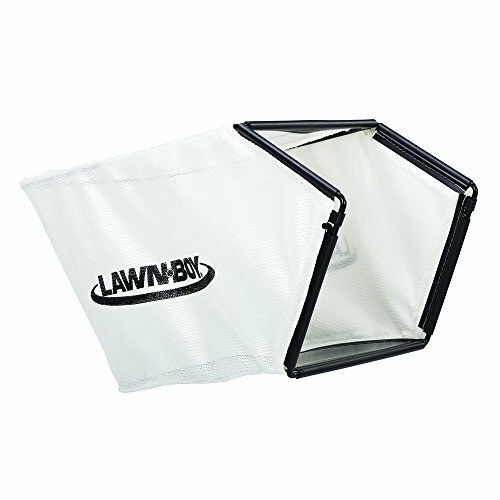 Also, the grass catcher doesn’t have a cover over it, and when the bag pulls away from the mower, you may find yourself spewing clippings and know that it’s time to change the bag. You could possibly design your own cover for this gap that can occur between mower and bag, thus cutting down also on dust and debris as you’re walking behind the mower. The side-discharge chute is easy to attach and can be ordered separately. One underrated feature of this mower is that it’s capable of getting close to edges. The L-B 17734 has a key for starting, which can be kept out of reach of children, and a blade-control bar that will engage or disengage the mower. 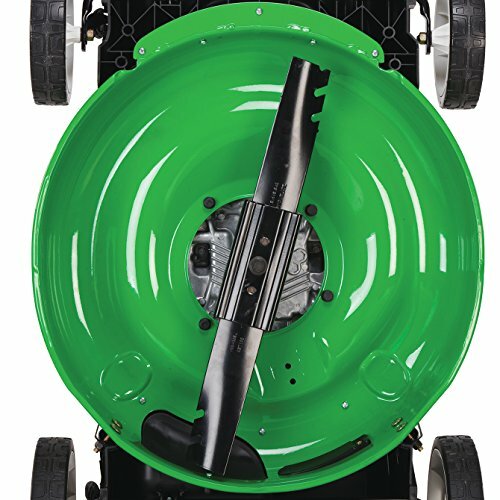 On a mower that has many top features, probably the best aspect of the L-B 17734 is its 21-inch cutting deck that has an outstanding blade design that prevents clumping. Though the engine is small, it’s also powerful and is guaranteed to start right up. 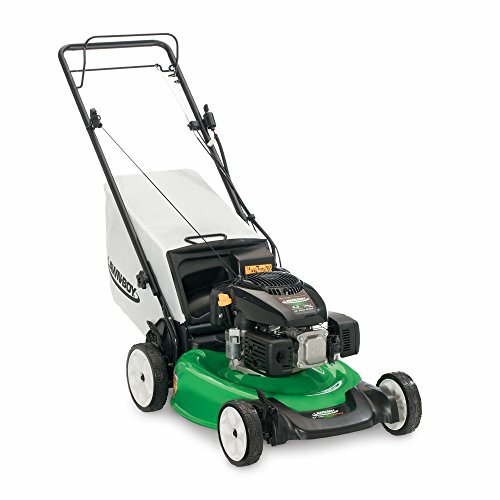 Those features, along with easy-to-adjust cutting heights, make this a solid self-propelled lawn mower. When you compare the L-B 17734 mower to others made by Lawn-Boy, you’ll see that it has a few extra options, namely, electric starting and self-propulsion, that give it an edge. Dig deeper and you’ll find that it’s competitively priced compared to other brands considering all of its great features. Taking a look at some of those cost-effective features, the L-B 17734 has 3-in-1 mowing options, with the mulching option a fine choice that will provide free fertilization. The low-maintenance engine is designed to last and last, and it probably will. Also, given that this machine can ease close to edges and slice grass right down, you may not need to invest in a weed wacker. 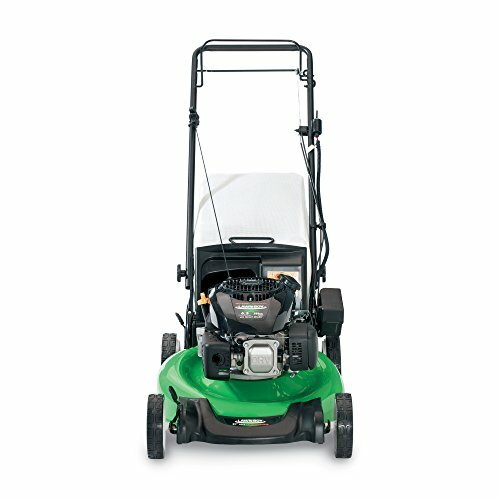 This mower was built to be CARB compliant in California, which tacked on extra dollars, but again, it’s inexpensively priced when compared to other mowers in its class.